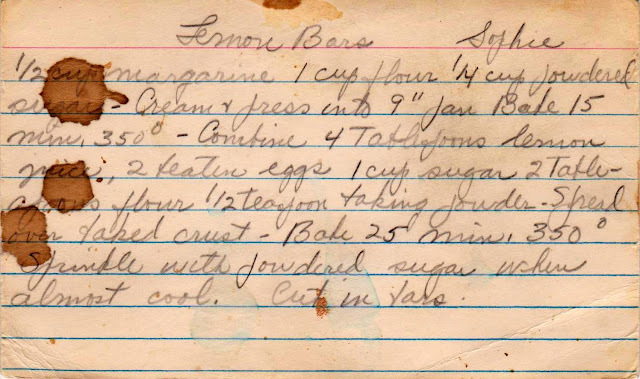 Lemon Bars, like this one from a vintage recipe card, were ubiquitous during my childhood -- a plate of these tart and sweet treats appeared at nearly every gathering, from the ladies' afternoon card games to pot luck dinners. 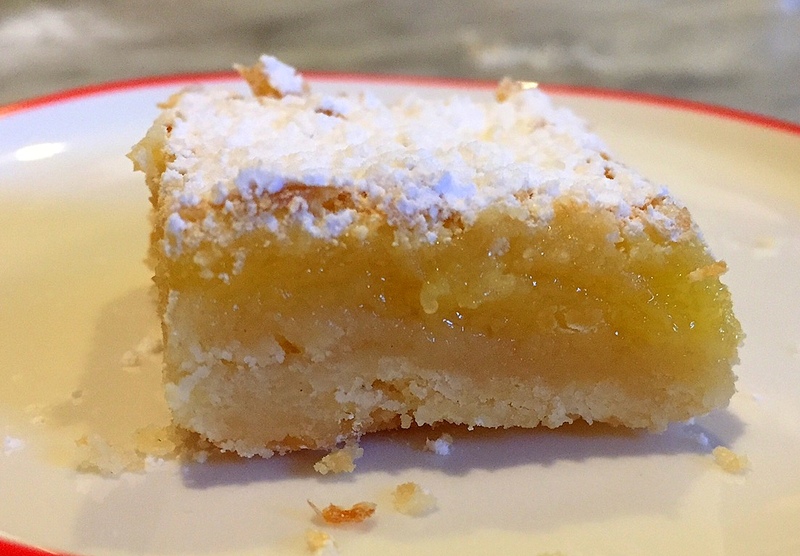 Created by Betty Crocker in in 1963, the lemon bar caught on like wildfire. 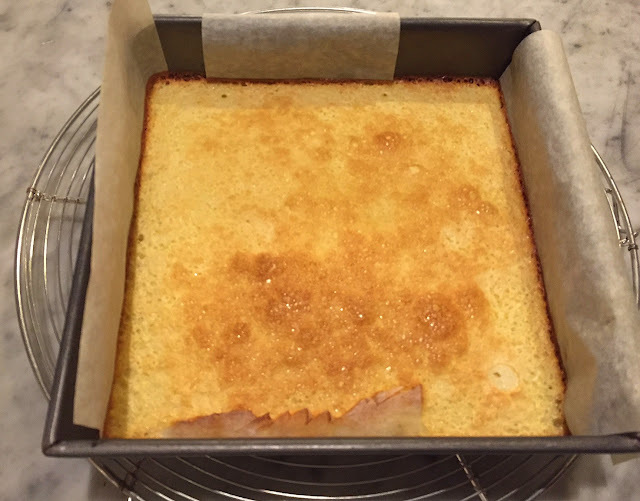 And for good reason -- they are a delicious combination of a cookie base topped by a tart lemon custard. They are still quite popular, albeit with some modern twists, like the addition of lemon zest to ramp up the lemon flavor. Did I mention these are a snap to make? I whipped these up for my dear friend Suzanne, a huge fan of my red velvet cake. 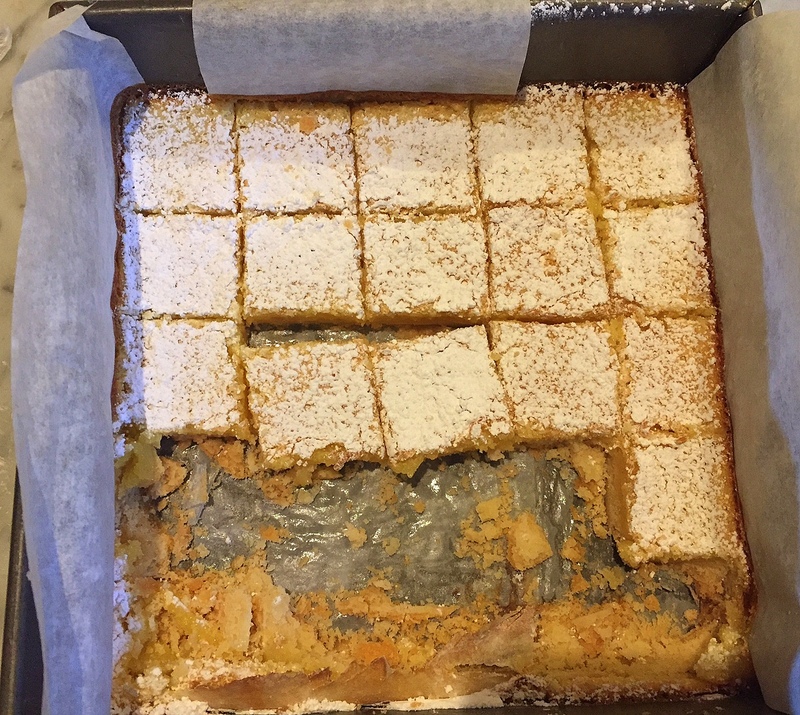 And I hope these lemon bars too! Until it is spread evenly. Bake for 15 minutes. It will look rather raw, but remember, it will get a second baking. 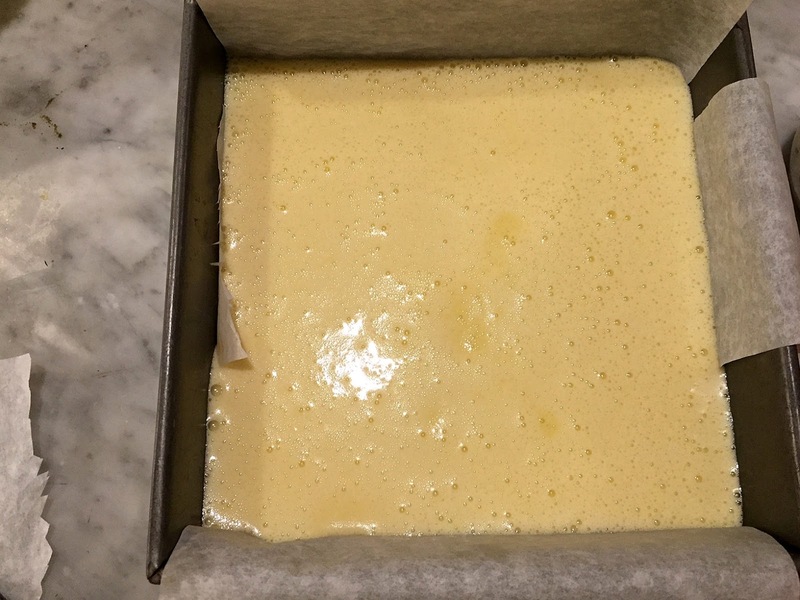 Prepare the lemon topping, which you can do while the crust is baking. Beat the eggs well, and add the sugar, flour and baking powder. Mix it well. Pour it over the prepared crust and pop it in the oven. Remove it from the oven and let it cool a bit. 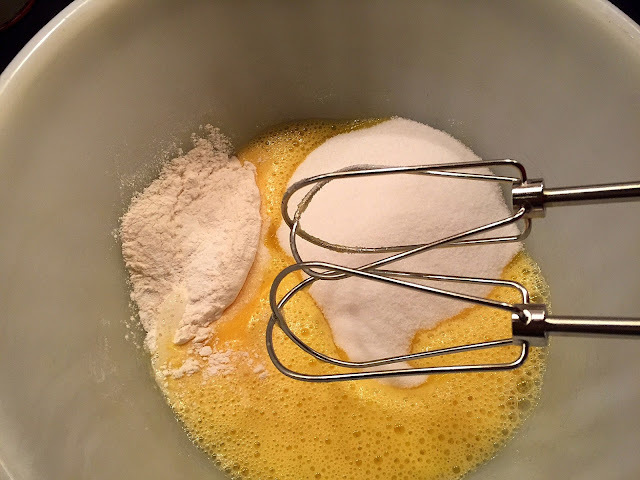 Sprinkle it with confectioner's sugar, using a strainer for even coverage. 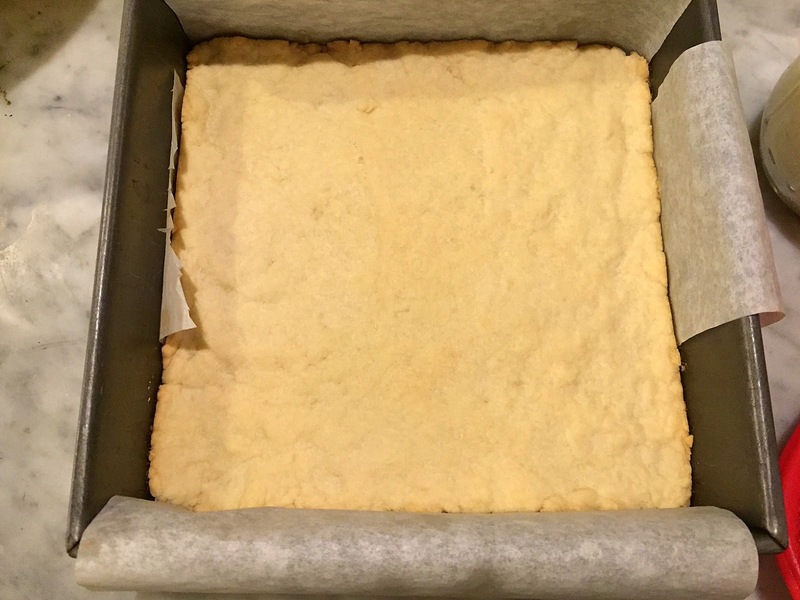 Let cool completely and cut into squares. Production notes: I followed the recipe almost exactly, but have typed out instructions below this rather stained recipe card. 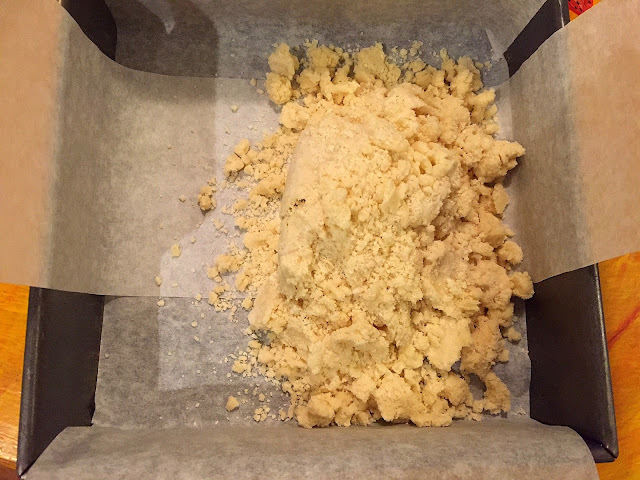 I tried to create a sling with parchment paper, but didn't cover the entire pan as I usually do. It was a big fail, and I could not get the cake out in one piece. 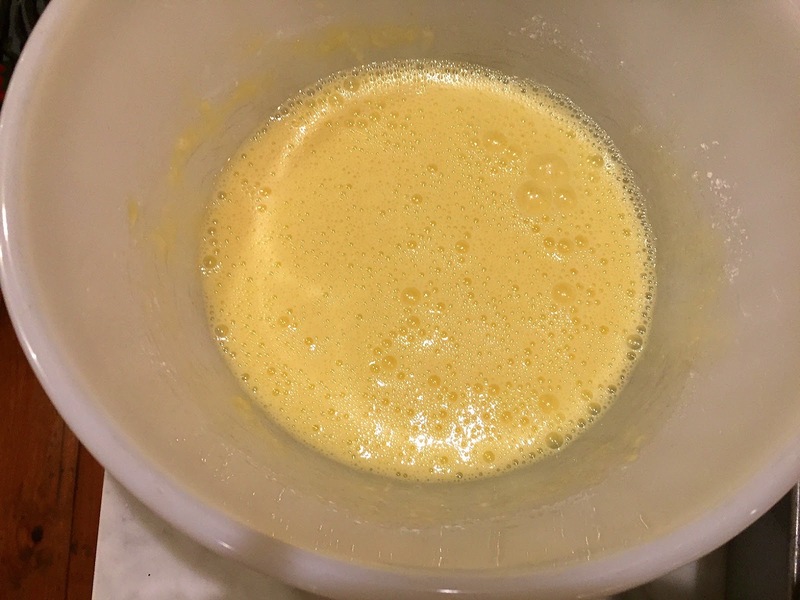 I also beat the eggs first, really, really well (not to the point where they form a ribbon, but almost). 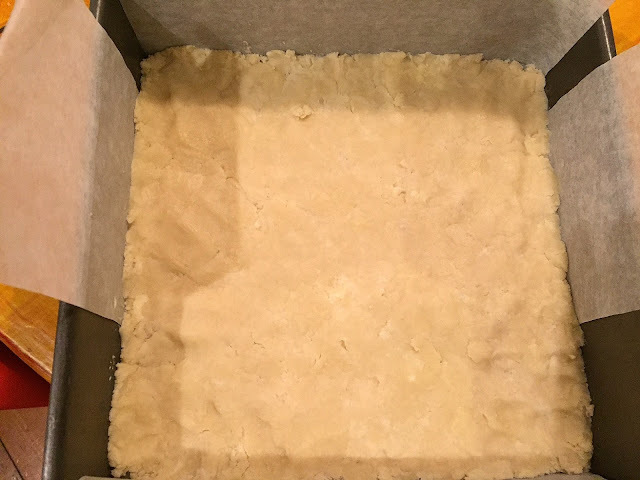 Place into an 8 x 8 or 9 x 9 inch square pan. Beat eggs a lot. Add the rest of the ingredients and mix very well. Pour over crust and bake for 25 minutes. Sprinkle with confectioner's sugar when almost cool. They will firm up while cooling. Lemon Bars are my go-to dessert, they never fail, are always delicious, come together quickly and most bakers will have the ingredients on hand. Thanks for sharing. I remember the first batch of lemon bars I ever made. I think I was ten years old, so it was 1967 or thereabouts. I still make them all the time. I made a batch to take to a dance festival a couple of weeks ago, along with some other things, just because I had all the ingredients on hand and why not, and they vanished in a flash. Next year I'll double the recipe. I'm curious about the addition of baking powder to the topping, which I have never used. Does it make the curd drier/fluffier? A stained recipe card is always a good sign!